It's time for your annual flu shot. Flu season is usually in full effect by the end of October. Early vaccination is advised because it can take up to two weeks for the benefits of the vaccine to fully take effect. 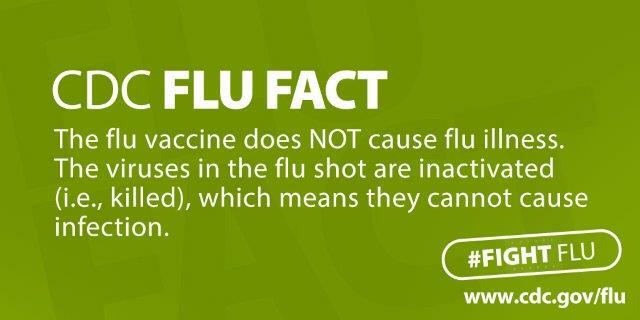 Receiving the flu shot is important because it can reduce flu illness, doctors' visits, missed work and school due to flu, in addition to preventing flu-related hospitalizations. Although getting vaccinated early is recommended, receiving the flu shot at any point in the season can be beneficial in preventing or minimizing many of the flu symptoms a person can experience. Symptoms of the flu include some or all of the following: body or muscle aches, fever, cough, sore throat, runny nose, and fatigue. Those who are at higher risk for having complications with the flu include children younger than 5, adults 65 years and older, pregnant women, and those with chronic medical conditions. Cover mouth and nose with tissue when you cough or sneeze, immediately throwaway tissue when done. Wash your hands with soap and warm water. If soap and water are not available, use alcohol-based hand sanitizer. Avoid touching nose, mouth, and eyes as much as possible. Clean and disinfect surfaces and objects (e.g., door handles, light switches, tables, etc.) that may have come in contact with flu germs. Limit contact with others if you are sick, including staying home from work or school when you are sick or contagious. Report flu outbreaks. Long-term care facilities, hospitals, schools, and other institutions are required to report outbreaks of influenza-like illness (defined as a fever plus cough or sore throat) to Klamath County Public Health. Public Health can provide assistance to implement infection control measures rapidly, to limit the spread of infection. Please contact your doctor or pharmacist to find out when and where you can receive your flu shot. "Take charge of your health," urges Kellie Hansen, RN, Senior Public Health Nurse. "The flu vaccines will continue to be the single best way to protect yourself, your family and your community against the flu virus. Get vaccinated today." Help prevent the spread of flu by receiving the flu vaccine and practicing these preventative measures.